Last night, we had the first thunderstorm of the season. The windows rattled with each strong rumble of thunder, and the rain pelted against the house. There was even a power blip, but fortunately it didn’t last long. Was this winter’s emphatic farewell? 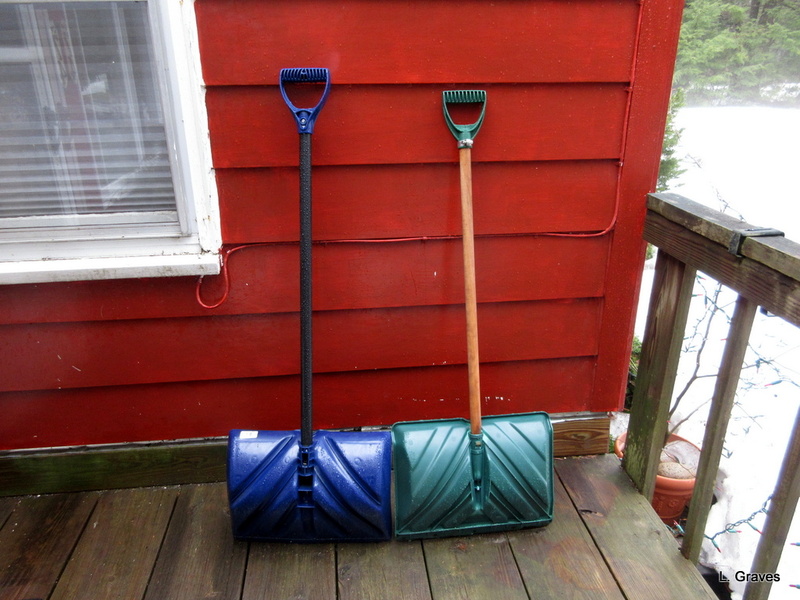 It is, after all, April, the beginning of spring even for Maine. We shall see, but I am hoping in the next few days that these little beauties can be put away. The strong rain brought flood warnings to the southern part of the state. 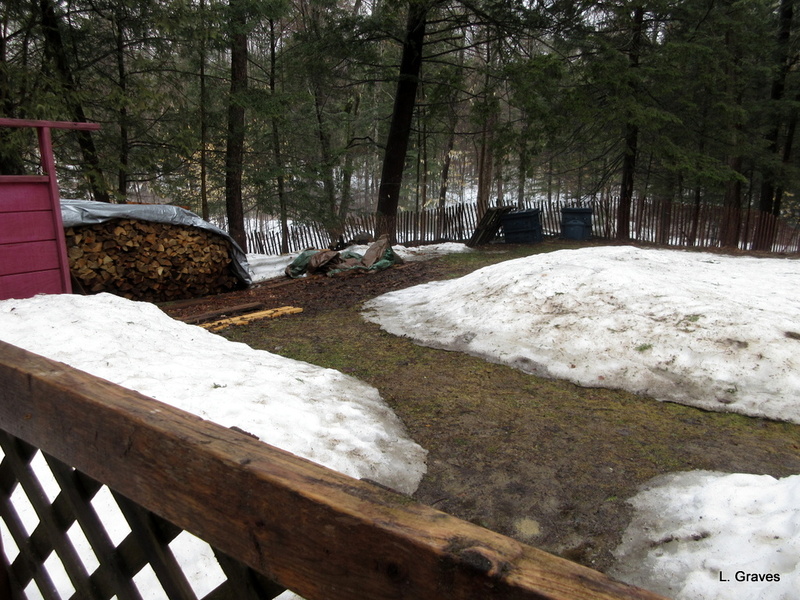 In the backyard, it whittled down the snow to such an extent that there are now bare patches of lawn. And mud. And plenty of branches to be picked up after the winter storms ripped them from the trees. It feels as though we are in a purgatory, of sorts, in a dreary, almost hopeless place between winter and spring. Yet this morning as I was taking pictures in the backyard, I could hear the roar of the little stream in the woods as it rushed to the Upper Narrows Pond. Free from ice and strong from the rain, the stream’s voice was loud, insistent, exhilarating. If my knees were less creaky, I would have made my way to the stream, clambering through the still-deep snow and sliding down the bank. Then, I would have dipped my hand into the cold, rushing water to feel its spring journey. Never mind! The stream’s song more than made up for the ugliness that is now the backyard. Spring is coming, and that’s exactly what I needed to hear. When the street sweeper comes by, finally getting rid of the salty sand put down by the plow trucks, now that’s spring!! The sweet sound of the street sweeper! 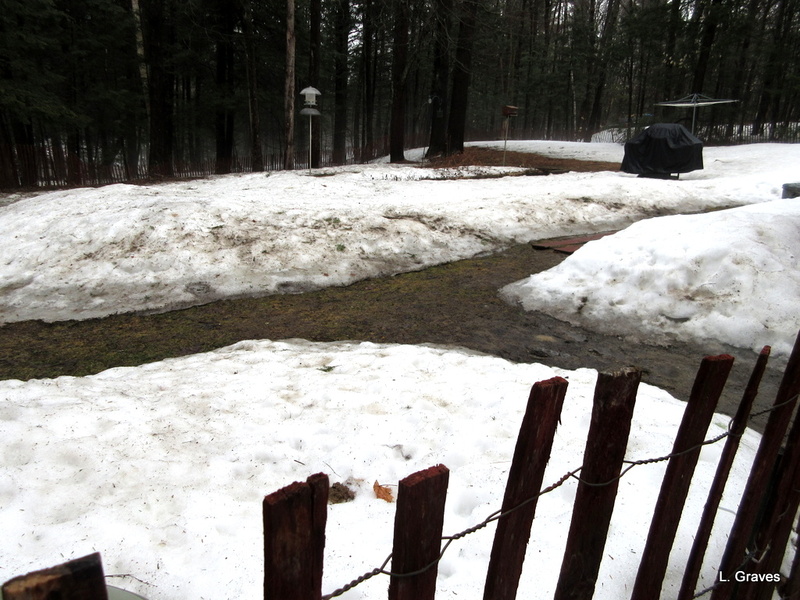 Time of mud and dirty snowbanks. I hear we are heading into a warm spell … 70 degrees, do I dare believe it? Wishing you beaucoup sales tomorrow! Love it! The roar of spring. There’ll be green shoots before you know it! I loved reading this post, Laurie! Yes, there are sounds, and sometimes scents, that tell us a change is coming well before things look any different. I am so pleased the rushing stream has given you hope! The stream was right! As today’s post—Monday, April 10—illustrates. Hope is here! Spring is coming. Your part of Maine looks a lot like my part of upstate New York–sloppy, muddy, not yet green. We’re under flood watches, too. It doesn’t look promising at all and, yet, I just *know* we’re about to turn a corner! But what a difference a week can make, the subject of today’s post! You paint such an attractive picture of Maine!